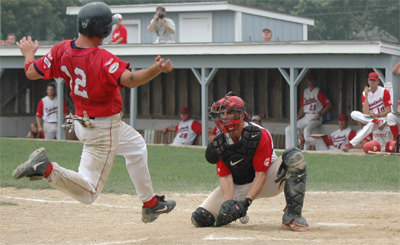 Saturday’s game two of the Cape Cod Baseball Championship had the looks of the six previous games in the 2005 playoffs, games that have come down to the wire and have been determined by one or two key plays. In what could have been the last home game at Coady Field the Braves put on a show for their loyal fans. Although hazy, the fans still came out to produce a huge fifty-fifty pot of over $1,000 to the winner. The crowd’s thus far in the playoffs have been tremendous, the highlight being the 9,000 in Orleans earlier in the week as they took on Chatham. Robbie Widlansky scores when the ball came loose. The game featured Florida Southern product Dan Albritton a closer for the majority of the season with Orleans and JR Crowell of Tulane. Both pitchers faced a threat in the first, but then proceeded to settle down until the sixth inning. In the bottom of the first the Braves took an early edge after a Robbie Widlansky double scored Tim Mascia. Albritton ended the threat by getting power hitter and star pitcher Brad Lincoln to fly out and retiring six hitter Ty Wright by way of the K.
The pace of the game began to pick up, with no action until the fourth inning. A great play from Robbie Widlansky ended a threat after he made a tremendous play on a line drive from Brett Pill. Widlansky caught a rocket line drive and then made a heads up play by beating Orleans’ centerfield Colin Curtis back to the first base bag. Widlansky was arguably the player of a game, shining in the field and with the bat. After Albritton got the first two out in the sixth with ease a double to left forced manager Kelly Nicholson to go to the bullpen. Orleans left the task of keeping the game close up to David Coulon. Unfortunately he was unable to handle the responsibility giving up an infield hit to pinch hitter Brett Bartles, who went 3-3 on the day. Coulon couldn’t find his control as he walked Ty Wright to load the bases and catcher Josh Stinson which scored a crucial run making the score 3-1. One out was all Coulon needed but was able to get it only after giving up a two RBI single to Beau Mills, son of Red Sox bench coach Brad Mills. The Braves added insult to injury for Coulon who struggled again in the bottom of the seventh inning giving up five runs. The big hit came off the bat of Brett Bartles who cleared the bases with a three run double putting the game out of reach. Crowell lasted into the seventh inning for Bourne scattering only three hits, giving up one run and striking out three Cardinals. Crowell looked poised to go deep into the game but gave up a very hard hit ball that was caught on a great play by the leftfielder, then proceeded to walk one and have the next batter Robert Perry reach on an error. Nick Manganaro was called upon but gave up what turned out to be an insignificant run before ending the inning. This run was, however, charged to Crowell who before that had not allowed a run in a flawless performance. Despite the run, after the game Crowell and his fellow Braves were all smiles as they lived to see another day after a nearly flawless 10-1 victory. Manager Harvey Shapiro was very pleased with the outcome and wasn’t too surprised with the ten run performance. Shapiro was very excited to see the Braves live another day and felt the performance from his starter was a great one. Robbie Widlansky felt great about his performance and was glad to send the Bourne fans home happy.